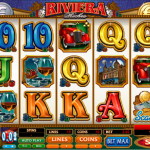 Riviera Riches is a very elegant video slot game from Microgaming. If we try to find the group that this slot belongs than it would definitely be a luxury game and there is no better place for high life than the French Riviera. This is exactly where this slot takes us, and all you need to do is to dress up and show up. Many of the symbols reflect riches of some kind and reels are placed in a golden frame. So, light your cigar and let this slot take you on a glamorous journey. 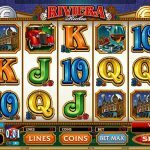 Riviera Riches is packed with special features like Free Spins and Roulette Bonus. There are also bonus symbols that at certain time will compliment your wins. We have a wild, the Riviera Riches, which substitutes for all the other symbols except for the scatter to help you land a win. Then we have a pile of money which is a scatter and it activates the free spins, you will get 12 free spins with tripled wins. But that is not all. You can re-trigger the spins and also you can activate the Roulette Bonus from here. And last but not least we have the bonus symbol that appears on the first and the fifth reel and it activates the Roulette Bonus where you have 2 spins. 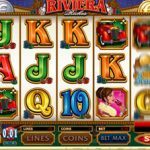 There is no doubt that Riviera Riches is one of Microgaming’s most popular slots. The game has everything we are looking for in a slot. It is a luxurious themed slot powered with some of the most desired special features and betting options that will make any kind of a player happy. On first look this slot seems complex but it is actually very easy to get the hang of. Another great example of a fun slot game is Rhyming Reels Hearts & Tarts a 5 reel slot by MicroGaming.